Sometimes the quickest, easiest and most effective update you can do is to simply add a splash of color and pizzazz to your space. Here are a couple of tips to help you with what can be a fun and inspiring activity. * To keep your costs down, check the “Oops” area of your big box store paint department. You can often pick up a whole gallon of paint that was just a smidge off of the color someone else wanted for under $5.00! 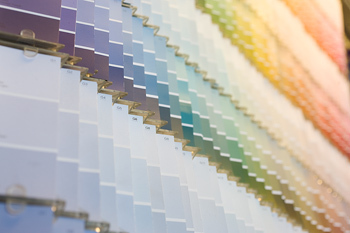 * Walk out of the store with your paint chip and take a look at it in natural light or bright sun to give you a true sense of what the color will look like in your specific space. If you have multiple lighting options, spend a couple of bucks and buy the paint sample so you can test it on all the walls of your room since lighting can certainly affect the finished look. * Spend the extra money up front to give yourself good tools (brushes, edgers, rollers, etc). You will accomplish more in a shorter amount of time with half the work. * Don’t be afraid to paint whatever you want. A garage sale table painted in an eclectic shade may become a showpiece desk in your home office. Mirrors, picture frames, chairs, etc. are just waiting to be refreshed and given a different life! Be creative and then enjoy your own creation, gracefully accepting the compliments of all those who see your work! * Always be sure and prep your areas or items to be painted or you may end up redoing the whole thing again. Sand and prime whenever necessary. * When painting a room with built in china cabinets, paint the inside of the cabinets to match the walls. This creates synergy and often a touch of elegance. * Don’t see painting as a chore but rather a fun adventure you can share with friends. Invite people you enjoy laughing and having a good time with and offer to provide food and beverages (note: save the martinis for after the painting is finished!). Have a great time, create a memory and make sure and offer to reciprocate the favor!